Shown with Coordinating Collection Sofa. Sofa Shown May Not Represent Exact Features Indicated. Provide a comfortable place to sit as well as an extra bed when company spends the night at your house. This sleeper features three welted back cushions and three welted seat cushions for a comfortable traditional look. Small rolled arms and a classic skirt base add to the traditional feel. 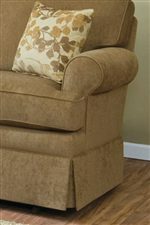 The William Full Sleeper Sofa by England at Furniture Discount Warehouse TM in the Crystal Lake, Cary, Algonquin area. Product availability may vary. Contact us for the most current availability on this product. Arm Small welted rolled arm. Leg or Skirt Classic skirted base. The William collection is a great option if you are looking for Traditional furniture in the Crystal Lake, Cary, Algonquin area. Browse other items in the William collection from Furniture Discount Warehouse TM in the Crystal Lake, Cary, Algonquin area.